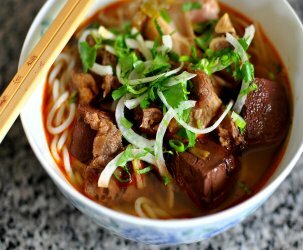 If Vietnamese noodle soups were a high school popularity contest, Pho would be crowned Homecoming King, while Bun Bo Hue would be voted Most Likely to Succeed. Bò Kho, on the other hand, would probably be chilling on the grassy knoll with the stoners; high and oblivious to the hype. Even though Bò Kho has yet to take the culinary world by storm, it is still my all-time favorite noodle soup. Bò Kho is hearty, a bit spicy, a lot savory, and absolutely delicious. I finally tried my hand at making Bò Kho with my grandma last weekend. As is the case with most of my family’s recipes, everything is prepared “by feel” and “to taste.” Since I know this dish like the back of my hand, these seemingly abstract spicing and seasoning methods are crystal clear. However, for those unfamiliar with this particular noodle soup, I’d highly recommend getting a feel for the flavor profile at a local Vietnamese restaurant or, even better, at your Vietnamese friend’s grandma’s house before preparing it at home. Grandma and I started our day of cooking at the Vietnamese grocery store. We picked up two beefy parts: tendon and shank. The quantities specified above will make a huge pot of Bò Kho with 10 to 12 servings. If you’re not cooking for a crowd or don’t appreciate ample leftovers, scale down the amount of meat. Begin by rinsing the shank under cold water to remove any impurities. Next, trim off the thick layer of cartilage surrounding the shank using a sharp knife. Also, trim any large pieces of cartilage within the shank and set them aside. Cut the shank lengthwise along the grain into 1 ½ -inch chunks and set aside. The tendon and shank cartilage are extremely tough cuts of meat and thus require a lengthy boiling period in order to tenderize. 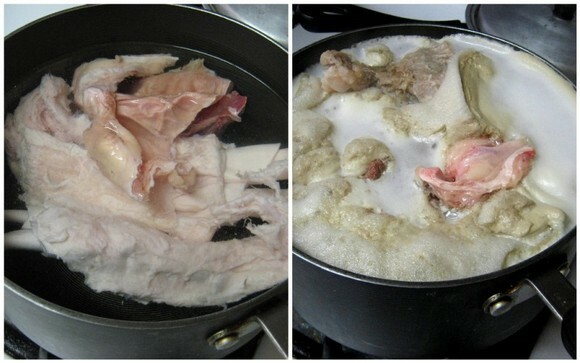 Boil the tendon and shank cartilage on medium-high heat for 2-3 hours in a medium-sized saucepan. Skim off the scum that forms on the surface with a wire skimmer. As the water evaporates, add in enough water to cover the entire surface of the tendon. 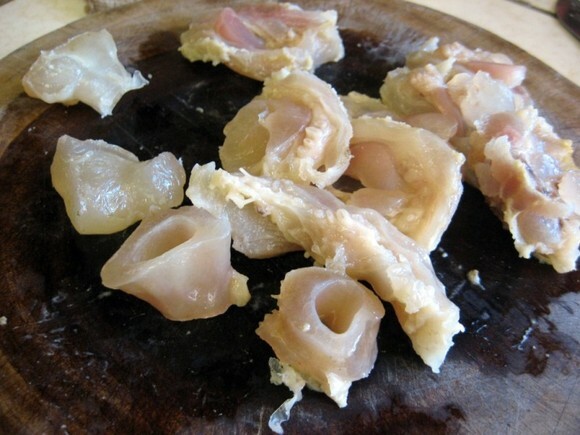 Once the tendon and shank cartilage is suitably tender, remove from water, chop into bite-sized chunks, and add to soup. While the tendon is boiling away, mince the garlic and shallots, finely chop the onion, and peel and cut the carrots into 1-inch chunks. 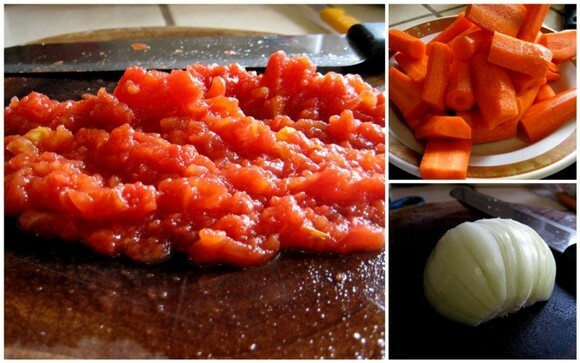 If there are any large chunks of tomatoes, make sure that they are finely chopped as well. Cook the onions, garlic, shallots, and bruised lemongrass stalks in a tablespoon of vegetable oil on medium heat until soft and fragrant. Next, add in 3 heaping tablespoons of Bò Kho seasoning along with the beef. Saute until the meat begins to brown on all sides, approximately 7 minutes. Season the mixture with 1 teaspoon sugar and 2 heaping teaspoons salt, and add the crushed tomatoes along with enough water to cover the surface of the mixture. 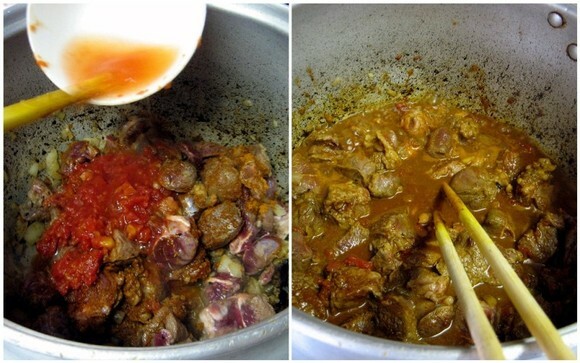 Let simmer on medium-low heat for 30 minutes in order for the meat to absorb the plethora of seasonings. After the simmering period, add the carrots and enough water to dilute the spices—approximately four times more liquid than the amount already in the pot. Season with several shots of fish sauce, a light sprinkling of MSG, and additional salt and sugar to taste. 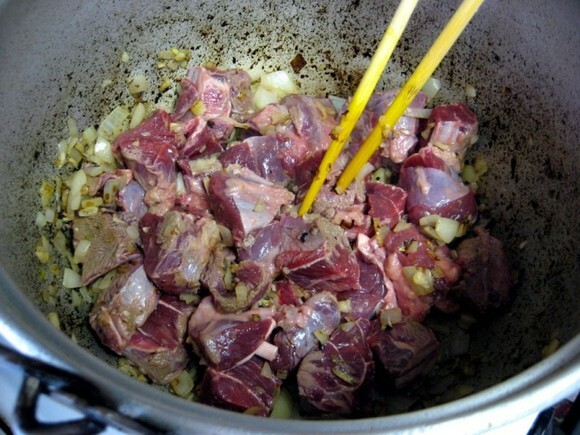 Cook the soup on medium heat until the beef and tendons are tender and the flavors have married, approximately 2-3 hours. Right before serving, do a final taste test. Add salt or fish sauce to intensify the overall flavor, or add a bit of water to dilute the broth. 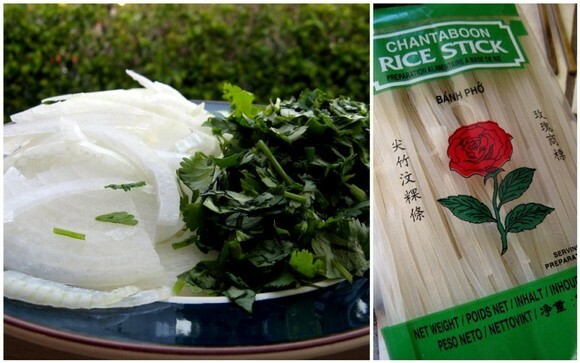 Ladle hot broth over wide rice noodles and garnish with freshly chopped cilantro and thinly sliced onions. Bò Kho can also be eaten with a toasted baguette. Mmm I love this stuff. Also good with daikon which I guess you might add at the same time as the carrot. I usually put half a pineapple in so that the beef is tender, and I eat this with thin egg noodle, or nui, with a lot of chillies *yummm*. This looks awesome although I’m slightly disappointed it’s not the recipe with “La vache qui rit” cheese..! @TonyC: why didn’t I think of that? 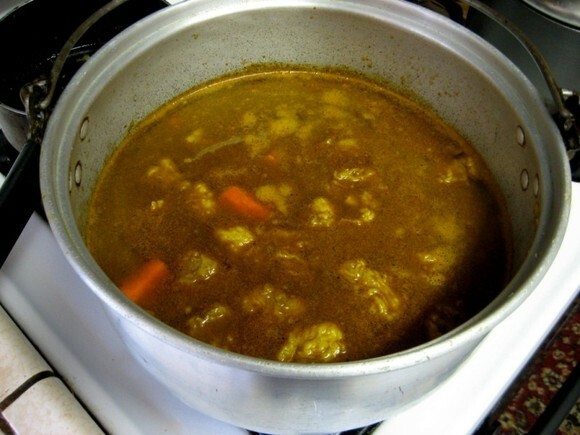 Why do grandmothers always make the best stews? Thanks for the recipe, to the detriment of my local bo kho lady who’ll be seeing less of me! i love me some pho, but i love me some bo kho even more! now if only MY grandmother could make this! I love this with toasted baguette and garnished with lots of lime and basil. One of my favorites! Great presentation, used your receipt today, tasted great the only problem I had was I couldn’t get the beef shank tender enough. 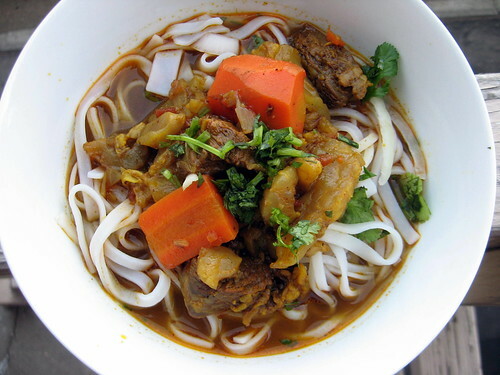 Thanks for the article … MBK is also my favourite vietnamese dish … the taste somehow reminds me a little of the northern english beef stews with thick gravy that I enjoyed as a kid … possibly the chunks of carrots and beef that are similar…!!! lol, no wonder those signs look familar. That’s the Vien Dong I go to as well. love the blog…making this recipe now! I fell inlove with Vietnamese food right after I fell inlove with my husband (or maybe at the same time). I love the Vietnamese recipies here. They are so much like the ones handed down to us by my mother in father in-law (better known as Ba and Me). Please publish more. I can’t seem to find con voy or three bells brand of ba kho. picture please? Is annato seed the primary ingredient in the powdered seasoning? Hi! 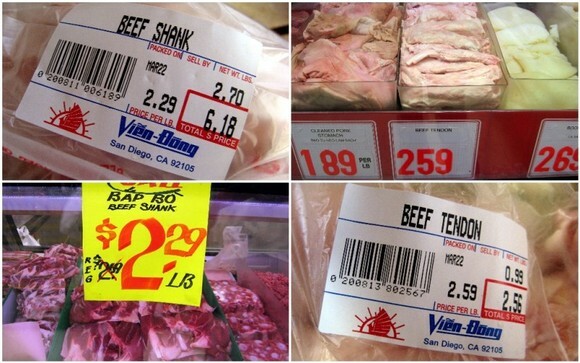 I’m kind of cracking up over here – we are from San Diego, and shop at Vien Dong when making Asian food when we are there. But right now we live in Puerto Princesa, Palawan, Philippines. There was a First Asylum Refugee Center here, and now most of the Vietnamese have repatriated, but they left behind some wonderful restaurants and foods. A favorite of ours is beef stew noodles. Here they call it chaolong, but I can’t find recipes on-line that sound like what we love here. The stew here has a clear red broth, chunks of very tender beef, and is served over noodles, with sides of basil and bean sprouts. 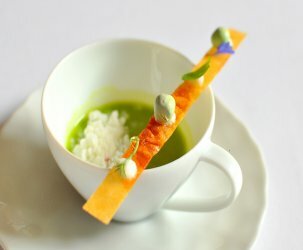 I want to learn to make this wonderful dish so we can have it when we leave Palawan. Your recipe looks “sort of” like what they serve here. I have always thought that star anise is used in recipes for “Bò Kho”. It is the star anise that gives “bò kho” its characteristic flavor. Andrew – Star anise is one of a plethora of spices found in the Bo Kho seasoning. The flavor really comes through. Pingback: Andy’s Vietnamese Food Cooking Spree | Do you know? That every day is the first of the rest of your life…. 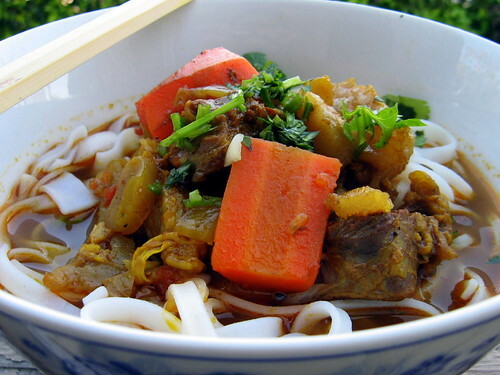 Tony – Using oxtails will give you a slightly different dish than classic bo kho. You’ll likely have shredded meat rather than neat cubes and the broth will probably be more gelatinous due to the marrow in the bones. Please let me know how this turns out. When/which step the beef tendon is added to the mixture? . Recipe said to cut it up into bite sized pieces and thrown back into soup. Do u add it at the end of cooking process or it is add in the same time as the carrot? Ann – This recipe assumes that you are boiling the tendons in tandem with preparing the broth. If that is the case, as soon as the tendons are tender and ready, add them to the soup. IF you are preparing the tendons ahead of time, you can add them to the broth along with the carrots. 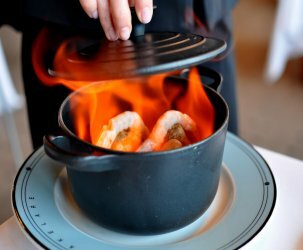 Have some questions about the cooking process. 1. Do you boil the meat and tendons first then sauté it with the garlic and onion or do you sauté the meat & tendons without having to boil it. In your picture it looks like the meat is still raw so I’m assuming it has not been cooked to tenderized but in the instructions it says to cook the meat & tendons beforehand. 2. Instead of boiling the meat & tendons in a seperatw pot can I can just cook it longer in the stew and skim the impurities as they appear? 1. Only the tendon and cartilage trimmed from the shank are boiled separate from the broth. 2. 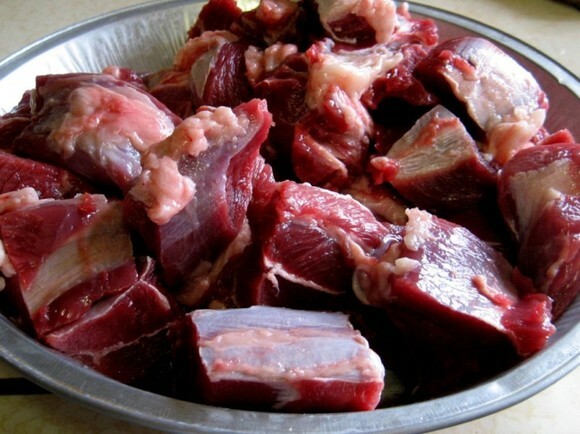 The tendon and cartilage are extremely tough cuts and should be boiled beforehand. Otherwise, you’ll risk the chance of overcooking the meat while waiting for the tendons and cartilage to tenderize. Made bo Kho usingt this recipe twice, love it!! !